Houseleek (Sempervivum spp. ): growing, planting, caring. A very common, and easy to grow, succulent plant. Scientific name : Sempervivum spp. Sempervivum is a genus of about 40 species of flowering plants in the Crassulaceae family, commonly known as houseleeks, or liveforever : the taxonomical designation Sempervivum literally meaning «forever alive ». They are succulent perennials forming mats composed of tufted leaves in rosettes. Morphologically, they are similar to the genera Jovibarba, Aeonium, Greenovia, Aichryson, and Monanthes, occurring mainly in Macaronesia (Azores, Canary Islands, Cape Verde, Madeira). 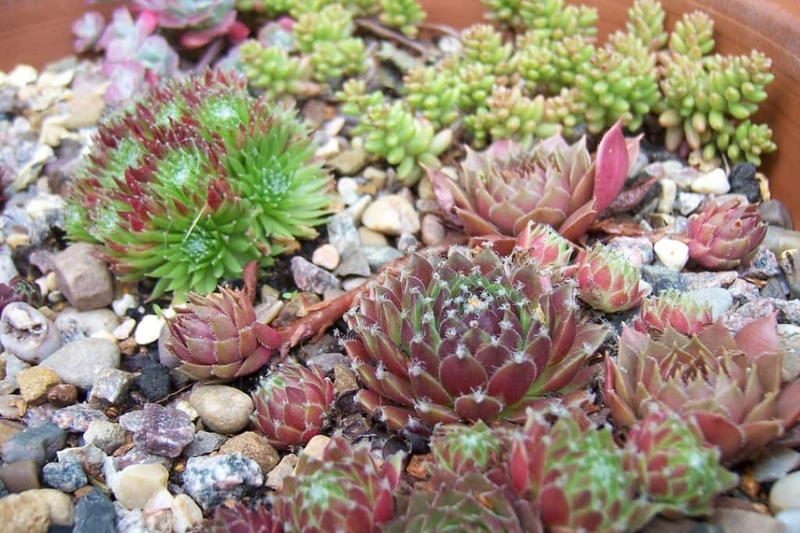 Some botanists include some or all of these genera within a wider interpretation of Sempervivum, particularly Jovibarba. Houseleeks are evergreen perennials in rosettes that develop in dry, even windy spots. Houseleeks grow in colonies of dense rosettes with pointed leaves, which measure less than 15 cm, and emit a floral stem of about twenty centimeters. After flowering, the rosette dries to give way to its neighbors. Depending on the species, the leaves and the flowers take a very different color, so it is not a clue to identify the genus - red, purple, yellow, blue, etc. Houseleeks like dry, well-drained soil. Dip the clumps in a tray filled with water to moisten them well. Plant them when the water is no longer flowing out of the bucket. Prepare the soil: dig holes, with a spacing of 5 to 20 cm, and mix the soil with sand. Plant. Cover with soil by tamping gently to avoid air around the roots, then water. Water little, even the first weeks because your houseleek can rot if the soil remains wet. Remove the dry rosettes from time to time, leaving the neighbors alone. The multiplication is super easy, because houseleeks grow in small colonies. You just have to take a tuff with its roots and replant it in a some soil or directly in a wall rift to get a new plant.